In his rebuttal of Mother Govinda dasi’s letter, “Book Changes: History Backs the BBT“, Jayadvaita Swami asserts that history supports his very strange claim that Srila Prabhupada and Hayagriva did not work together on the editing of Srila Prabhupada’s Bhagavad-gita. He claims that Mother Govinda dasi was wrong and that she did not ever see Srila Prabhupada and Hayagriva working together on Srila Prabhupada’s Bhagavad-gita. He very much respects his godsister, but still claims she could never have seen this… She is just plain wrong. And as the master of spin, he has quoted Srila Prabhupada to “prove” that Srila Prabhupada and Hayagriva never worked together on the editing of Srila Prabhupada’s Bhagavad-gita. And what is that quote? So Jayadvaita is trying to “spin” this quote where Prabhupada clearly says he and Hayagriva were working together editing Srimad-Bhagavatam to “prove” that Srila Prabhupada and Hayagriva did not work together editing the Bhagavad-gita… You have to laugh… or cry. Who could accept this “logic”? If Prabhupada and Hayagriva were working together at the end of 1968 on the Bhagavatam then surely that would indicate they worked together similarly on the Bhagavad-gita in 1967? We know that Hayagriva was working on editing the Bhagavad-gita in August of 1967. This work was disturbed by Kirtanananda, who returned from India to New York with a strange philosophy and convinced Hayagriva to go off with him to start another spiritual center that turned out to be the New Vrindavan Farm community. So Hayagriva was out of the picture for a couple of months. So we can see Srila Prabhupada finished writing the Bhagavad-gita As It Is in November 1966. Editing was given to Rayarama, who could not complete it, and then editing was transferred to Hayagriva sometime in 1967 [before Prabhupada went to India]. Then Hayagriva left with Kirtanananda for a couple of months and in this time Prabhupada tried to get Rayarama to complete the editing, but it seems again he could not finish it and it was again handed back to Hayagriva to complete. “I thank you very much for your letter dated March 9, 1968. I have come back to San Francisco on the 8th March, and while I was in Los Angeles for two months, I received the balance portion of Bhagavad-gita edited by you. I am expecting the foreword also, but I can understand that it was not yet dispatched. So, when it is prepared you can send it to me here in S.F. I am so glad to understand that you are missing the atmosphere of S.F. which you so nicely enjoyed last year, and similarly, I am also missing your company which I enjoyed last year here. In this very revealing letter we find that Rayarama again did not complete the editing and again the job of finishing the editing of the Bhagavad-gita As It Is was given to Hayagriva, and by sometime in February 1968, Srila Prabhupada received the “balance portion” of Bhagavad-gita edited by Hayagriva. Now Prabhupada is only waiting for the edited foreword to come from Hayagriva and the manuscript will be complete. Srila Prabhupada and Hayagriva were living together in San Francisco in 1967, which is the time when Hayagriva did most of the Bhagavad-gita editing. So this would be the time when Srila Prabhupada and Hayagriva sat together regularly and discussed the editing of Bhagavad-gita As It Is. How can anyone think that in 1967, when Srila Prabhupada had just finished writing his Bhagavad-gita As It Is in December of 1966, and now he was living in San Francisco with Hayagriva Prabhu, that they did not discuss the editing of Bhagavad-gita, which was the most important project in ISKCON at that time? Hayagriva also remembers, in his Hare Krishna Explosion book, consulting with Srila Prabhupada daily on the editing work for Bhagavad-gita As It Is. How does spin-doctor Jayadvaita Swami deal with this? And we have the testimony now of Srila Prabhupada, Hayagriva Prabhu and Govinda dasi, who all recall Srila Prabhupada and Hayagriva working together daily on the editing of Bhagavad-gita in 1967 in San Francisco. I have been listening to this controversy around the edited books, and I would like to make a suggestion/statement. If I had an employee that cost my business one million dollars through a lawsuit that I didn’t win I would fire that employee. Pure and Simple. His Holiness JaiAdvaita Swami Maharaj should be “put out to pasture” and preach the glories of Lord Caitanya throughout the world. That is his job as a Sanyasi. He is now old like the rest of us, and sufficiently realized in his Krishna Consciousness to have a profound preaching result. His work as Editor of Srila Prabhupada’s books has now come to an end, and it will cost millions more to reverse this mess. Send him on the road as a senior devotee. Hari Bol! PS: Dravida’s post does not deserve a reply. We all admit that there are some genuine typographical errors in the Bhagavad-gita and no one is complaining about correcting genuine typographical errors. Dravida is trying to use the tactics Jayadvaita Swami was using ten years ago. We have gone past that stage now. Some of the changes he mentions also should not have been changed. But I am not going to go down that path. 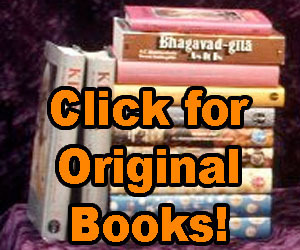 For further information, please refer to www.BookChanges.com. Thank you very much prabhu When I read perfect verses ruined by unnecessarily changing them it makes me very very depressed and angry I can only hope and support these efforts to return verses 2:20 3:39 as example to there former poetic ,powerful and authorized Glory !!! Srila Prabupadas translations must be maintained/distributed in original text. Meaning has been significantly changed by new Swami editing! This is hurt to Srila Prabhupada. Please honor Srimad Madhudvisa as well. He has managed to go even further – he is disgusted with people in Srila Prabhupada’s temples singing ‘Jaya Prabhupada’!!! !